I really don't know what to think about this. I went in thinking I was going to get a fun parody adventure, but I got an immensely disturbing (social) media commentary. For those who want a story, don't read this, that isn't what it is. For those who want a picture of how disturbed 'writing communities' on the Internet are, read it. I'm not sure there is a more accurate depiction of what's wrong with 'writing communities' on the Internet. The story, as far as I can tell, is a fictionalization of what goes on at Authonomy, a 'writing community' run by HarperCollins where the most read story gets a review from a HarperCollins editor. Naturally, this creates a ridiculous amount of unethical behavior from the members of the site who want to get their story reviewed (and possibly published) by the editor. Authonomy is far from the only 'writing community' that has these issues. Figment, a website owned by Random House, regularly runs contests where authors try to promote their work the most to win. Figment might actually be worse, as I know they allow minors to participate in contests and sometimes have errors in their official rules for contests. The largest problems with these 'writing communities' is that they are about forcing writers to compete for arbitrary prizes by self-promotion without any reference to the quality of the writing or reader response to the writing. Writing isn't about trading likes on social media. Writing is about the reader, first and foremost. 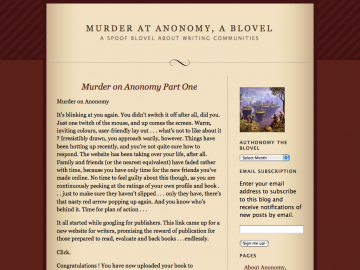 Muse's Success (and Web Fiction Guide, among others) can foster new writers not because it offers them prizes for how popular they are, but because it is a website geared toward readers. And writers need readers who genuinely care about their work. Tips for spotting predatory 'writer communities' If it isn't aimed mostly at readers, don't use it. If it makes writers compete for prizes based on any sort of popularity measurement, don't use it. If the website tries to make money off you, don't use it. If the website claims ANY rights to the work other than a non-exclusive right to display it, don't use it. Some big websites and how predatory they are: Authonomy - Predatory Figment - Predatory Wattpad - While Wattpad does have a few contests with some popularity based factors, they're very geared toward readers. Since the site has millions of readers, its less likely to be affected by the unethical behaviours depicted in the story. Fictionpress/Fanfiction.net - Not predatory. They don't have contests and are aimed primarily at readers. Web Fiction Guide - Not predatory. Totally cool. Muse's Sucess - Not predatory. Totally cool. I do want to thank the writer of the novella. It is very important to make sure writers don't get exploited.